Welcome to my “here comes Winter” Blog Party. It’s been awhile since I hosted a blog party or a link up party so I thought it was high time to do so. 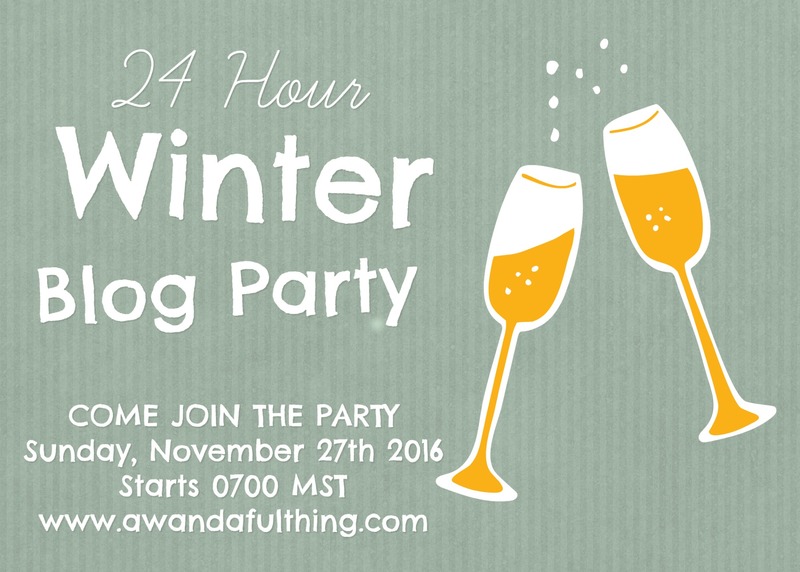 Now that the season has changed again (here in my part of Canada) meaning Winter is on its way, I thought it appropriate to have a Winter Blog Party. I am looking forward to curling up in front of my computer with a nice hot cup of tea (or three) and checking out your posts and blogs. So read the rules and I look forward to partying with you on November 27th. 1. Choose your favorite post from your own blog. The subject of the post can be anything you like just try to incorporate Winter in there somehow 🙂 Post as many as three but only one post at a time and be sure to spend time visiting other bloggers. But don’t start posting until November 27th. 3. Paste the link in the comment section of this post. 4. Blog posts only please! No Amazon pages, YouTube, Spotify or Etsy promotion – I will delete these and any further links from anyone who ignores this. 5. Enjoy! Relax, pull up a chair and meet new people! Find new blogs, comment on their posts, be polite, courteous and respectful and don’t forget to follow, reblog, tweet, pin and share. This is a really useful way of discovering new blogs. A good rule to follow is to check out at least two or three other bloggers for every link that you leave. Please feel free to invite your friends and you can reblog this post! I got this idea from participating in a Halloween Link Party at Suzie Speaks so please make sure you check out her blog too!! This entry was posted in DIY and tagged Blog, participate, party, share. Bookmark the permalink. The Cafe looks beautiful – lots of eye candy. I love the look of your blog, I checked out some posts and was drooling over the Cookies and Cream Hot Chocolate….yum!! Love it “you only have to forgive once” —- Let it go!! good reminder any day of the year! Feels like a constant work in progress some days! Very pretty. Can see in so many colors/ribbons. Brake for spontaneity, great reminder, especially at this time of year. Thank you for posting this. Enjoy your day and hope to see you back again! Too cute. Would be a great gift to attached to a hostess gift or Christmas card. Something extra and special. Looking forward to it. Enjoyed Suzie Speaks blog party so putting thinking cap for posts on now!